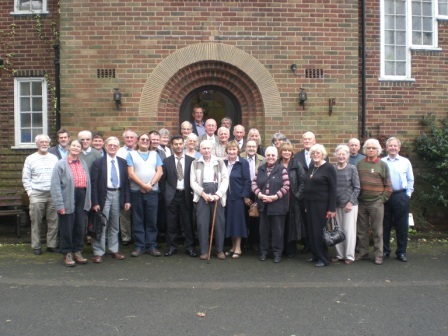 Held at our usual residential venue, Barnes Close, from late afternoon Friday 3rd Oct to lunchtime Sunday 5th Oct 2008, the twelfth annual Bromsgrove Conference was another record breaker – the most-ever attendees, 48. The evening began with Organiser Alistair McConnachie describing the theme of the Conference, “We have the Answer to the Crisis”, by rehearsing the 2 principle Money Reform proposals “on the table”. These are the Huber/Robertson reform, and the Rowbotham/James Gibb Stuart reform. This was especially valuable for over a third of the Conference, who were first-time attendees, and it helped to put the forthcoming weekend’s activity into context. 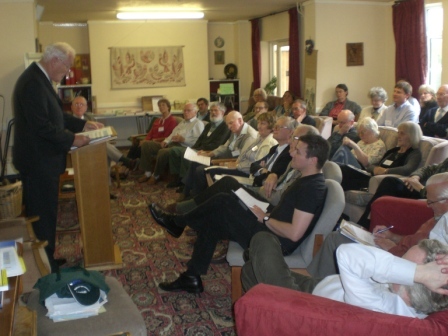 The Convenor of the Conference, James Gibb Stuart also made a short welcome and spoke about his hope for the “James Gibb Stuart Trust”, the registered charity which has now been established to promote its educational Objects (See Prosperity, Oct 08). The rest of the evening was dedicated to watching, and commenting upon, several YouTube videos, which we were able to project onto the wall, of Congressman Dennis Kucinich, who was coming out and speaking about our cause in a very forthright way – much to the satisfaction of all! Saturday began with Canon Peter Challen in his now customary role, beginning the main day’s events with a passionate round-up of the reforming efforts happening throughout the world. This was followed by Alistair McConnachie who gave a version of the speech that he had delivered at the AMI 2008 Conference (and published in Prosperity, Oct 08). You can purchase back issues of Alistair McConnachie’s Prosperity money reform journal here And here is a link to Alistair McConnachie’s Google Profile. After coffee, Carmel Butler, who has extensive experience in the financial sector, explained how “mortgage securitisation” and “derivatives” work. This was an impressive explanation that should, ideally – along with several other instructive talks at this Conference –have been filmed for YouTube delivery! Gary Fisher, monetary innovator, spoke on his experience in trading with a virtual currency and Frank Taylor continued the theme with the idea of establishing a banking system outside of traditional banking structures – for example, via mobile phones and computers. Robert Corfe described his theories published in his extensive 3-volume work Social Capitalism in Theory and Practice, and academic Simon Mouatt, used historical references to consider some wider issues of reforming the debt-based system. Mike Black, Charles Farrier and Barbara Ruiz then took us through a comprehensive proposal to campaign for a Royal Commission investigation into the economic system. Malcolm Parkin ended the afternoon’s presentations with some important points on “Getting the Message Across” (see back page of this issue). After the evening meal, one of the furthest travelled attendees Don Chisholm from Ontario, spoke on wider ideas of economic change, especially related to the concept of Gaian systems. Robert Welham presented a wonderfully short and concise introduction to Money Reform which, again, really needs to be videoed and put on YouTube. Jasper Tomlinson introduced a Parliamentary Petition and the evening ended with Tracy Worcester showing a short trailer for her highly recommended new documentary “Pig Business” about the corporatisation of pig farming in Eastern Europe. Alistair McConnachie reported with photographs and the aid of the digital projector, on the AMI 2008 conference and Jamie Walton, who helped Stephen Zarlenga organise it, talked about his observations and impressions of the movement in the USA. Ron Rankin (pic below) spoke about his own impressions of the financial scene in New Zealand and Australia after his recent working holiday down under. MAKE A DATE FOR THIS YEAR!